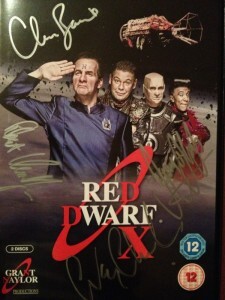 Win Red Dwarf series 10 on DVD! Update: The winner has been chosen and the DVD is currently making it’s way to the lucky winner! We’ve got a copy of the new Red Dwarf series on DVD to give away to one lucky winner and better than that it’s signed by all the cast! All you have to do to enter is buy a Bucky T-shirt by the end of November 2012 and start believing in “Cloister” until we pick the lucky winner the day after. The competition is open to anyone in the UK and you can enter as many times as you like to increase your chances of winning (each separate order will count as an entry). If you’ve already bought a T-shirt then rejoice! as you’ve already been entered one time, otherwise get yourself over to the ordering page and place your order for a chance to win now! Don’t forget that there’s also another competition you can enter once you receive your T-shirt to attend the gala screening of Danny’s short film ‘Bucky’ as his personal guest! More details can be found at the bottom of the ordering page. This entry was posted in Bucky by admin. Bookmark the permalink.